Swelling: Probably has gone down some. Chin still swollen. Other weirdness: It was going to rain tonight and my jaw joints ached a bit. Also, I seemed to have developed some sort of acid reflux. Mood: Freaked out a little about appearances and X-rays. My blogging routine has been upset a little as my days have been filled with... random stuff I think. And I seem to be so tired at the end of the day, I just give it up altogether. Other than strategic work discussions, I spent the first half of yesterday obsessing over my x-rays that the doctor sent in and trying to decipher them. I started googling things like "how to read dental x-rays", "labelled skull x-rays" and stuff like that. It was mind boggling... but I couldn't look at too many of them cause a lot of the Google Images that showed up were those of skull trauma patients where you could see the x-rays of all sorts of stuff stuck in skulls, and I couldn't manage looking at those. Eventually the insecurities set in and I actually allowed myself to go into googling "nose shapes and ethnicities" (because it seems my nose has turned up quite a bit), and worse, looking for evidence of "uglier after jaw surgery". How horrible is that huh? 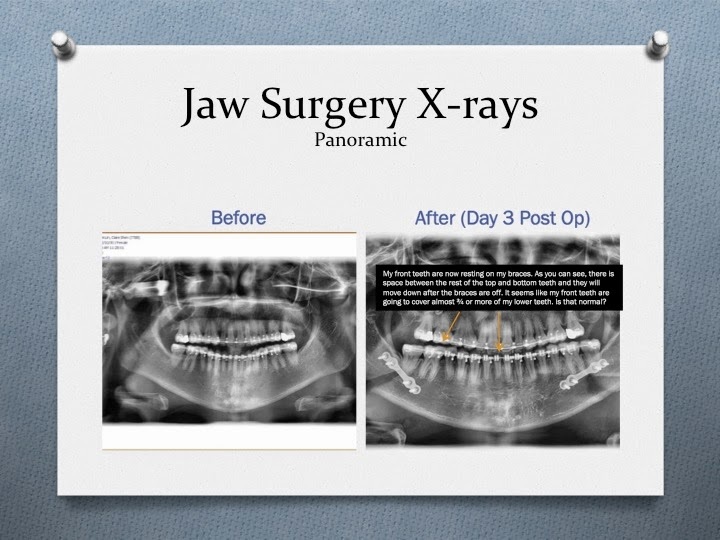 At some point of time, I was tired and frustrated, and decided to fight the destructive behaviour, that I compiled a powerpoint of questions with my X-rays and sent them off to my dentist (who's also a friend) in hopes to get some answers and calm the nerves. Yes, I was super swollen on Day 3. And yes, by all the questions, it is plain that I was SUPER freaked out. 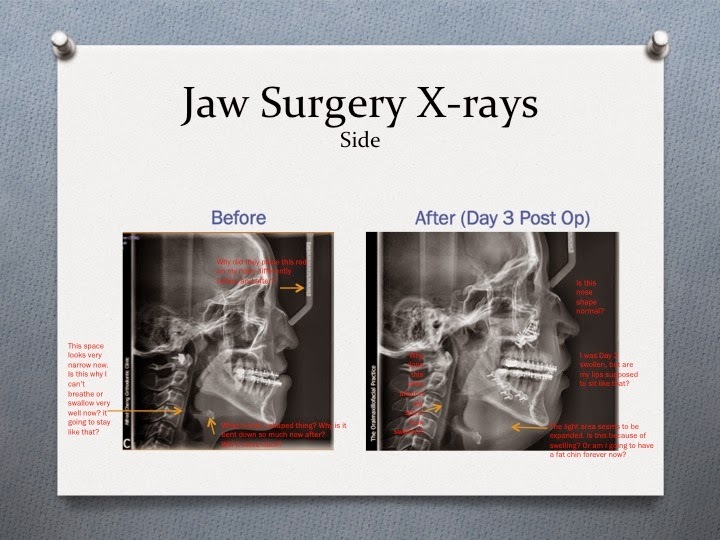 Weird things jaw surgery patients think right? But taking a calmer and more objective view, my teeth actually meet now which is amazing. Why didn't I just ask Surgeonman? I think it's because I think he's busy and didn't want to bother him with my anxiousness. I probably also didn't want him to think that I don't trust him and have my little panic attack affect our relationship. Thought it'd also be good to hear from my friend what she thought. On a happier note, now that I'm a little less swollen, I can't wait to take the next set of X-rays. Also can't wait for some answers. I'm pretty sure all the answers are going to be - "Oh, that's cause .... that's normal" and "oh, you don't have to worry about that." Well, at least I'm hopeful. For the past two days I've been experiencing some sort of acid reflux - where I would somehow have a sudden acidic bitter vomit-y taste in my mouth every couple of hours. It's really gross. I couldn't quite get answers in a quick online search that matched my situation because acid reflux is usually caused by obesity (nope), smoking (nope), high intake of salt (nope), low physical exercise (maybe... ), and overeating (definitely not :(), so I sent the questions off to the clinic, as well as to my dentist, and posted it in a jaw surgery community group on FB. Answers that turned up were that it could have been caused by an overdose of anesthetic (probably not because it's only happening now), intubation (again, it's been a while), or painkillers (chaching!). It has been a habit of mine to take one painkiller with my antibiotics pill since I got home so it is probable. From today on, I've decided to try to not take anymore painkillers and see how it goes. Other than that, I wasn't very productive yesterday. I think the only things I crossed off the list was drink my milk and prune juice, as well as getting some work done. That was pretty much all of yesterday. I'm going to try to make it a really productive day today. I have a friend dropping by in between, an interviewee for work (which I'm just sitting in), and a work trip out to the lawyers. I hope the energy keeps up!